After travelling for over a decade now it can’t always be easy to remember everything that I have seen or done. One thing that I certainly hadn’t thought about for a while was the amazing wild life I have encountered on the road. That was until I came across the really informative infographic from ROL Cruise about the different animals around the word – I have shared it below. Meeting the elephants in Thailand was so good I had to do it twice, once with my sister and once with my girlfriend. It’s jaw dropping being stood next to these huge creatures as they use their trunk to eat the bananas you’re feeding them. When it comes to bath time it’s a wet and muddy affair, but brilliant fun. Make sure you choose a reputable place, do your research and have the time of your life. 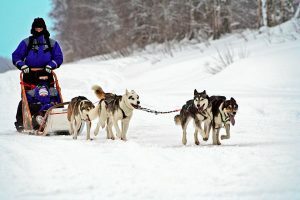 Heading to the Arctic means that you simply must get on board a sleigh and ride with the huskies. The dogs are so powerful and surprisingly big, but what surprised me the most is that they are extremely friendly. We had an absolute blast riding in the night through the arctic in a convoy of sleighs. Standing on the sleigh without any previous experience can at times feel daunting and you certainly feel the adrenaline pumping through your veins. What has been the most memorable wildlife you have met on your travels? I’d love to hear about your experiences, thrills and funny moments. All you have to do is pop your thoughts down in the comment section. I hope you enjoy this infographic as much as I did! I certainly ended up learning a few things and added a few more to the list I need to see in the future.